What were the performances that captivated you and what were the ones that left you cold in 2017? As the year draws to a close, we invite you to revisit the local productions staged in 2017 with critics from Centre 42's critical writing platform Citizens' Reviews and online arts publication ArtsEquator. 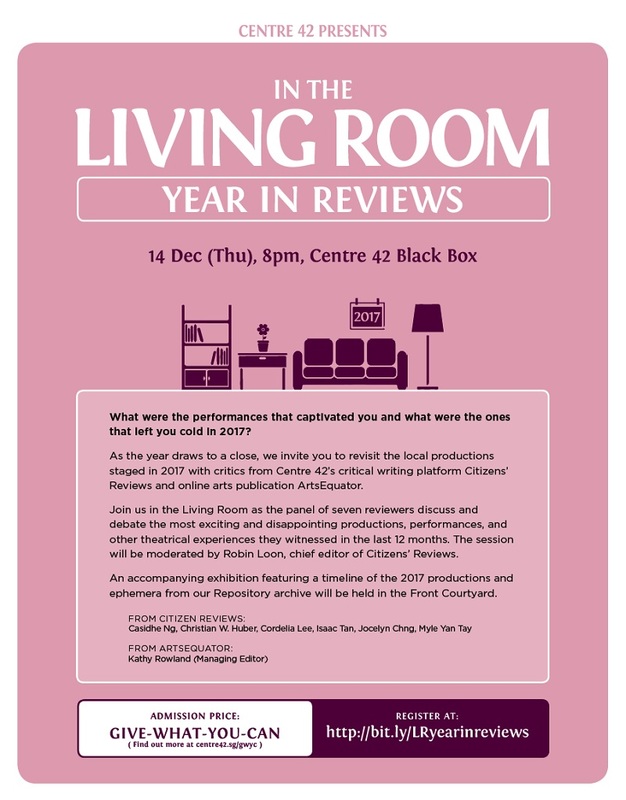 Join us in the Living Room as the panel of seven reviewers discuss and debate the most exciting and disappointing productions, performances, and other theatrical experiences they witnessed in the last 12 months. The session will be moderated by Robin Loon, chief editor of Citizens' Reviews. An accompanying exhibition featuring a timeline of the 2017 productions and ephemera from our Repository archive will be held in the Front Courtyard.